Digital image sharing isn’t new. For many years, radiologists have shared images with each other from their PACS over T1 lines. Physicians also have put exams and reports on CDs and given them to patients to take to their medical appointments for treatment or second opinions. Sharing those images in real time over the Internet is the next step in that evolution, changing practice and perhaps improving health care and reducing costs. Numerous vendors offer platforms that allow physicians and patients to share their diagnostic images almost instantaneously and wherever they have a device with Internet access. “Using an Internet-based solution, seconds after I want to share something with you, I can,” says Hamid Tabatabaie, CEO of lifeIMAGE, a company in cloud-based image exchange. Arman Sharafshahi, president of Accelarad, creator of SeeMyRadiology.com, says that “there is no reason why every hospital or imaging facility can’t do image sharing through our cloud platform in the next couple of years.” But, he says, as with anything in health care, it takes awhile to change practice, and he expects this change could take up to 10 years to complete, like the switch from film to digital and PACS. Vendors and radiologists expect more facilities to use cloud image sharing, as they are under pressure to show they are using EHR technology in meaningful, measurable ways. After 2015, Medicare will require everyone to meet its meaningful use standards or they could be subject to financial penalties. Security concerns may be holding back some people from using cloud image sharing, says Kao, who likened the situation to when banks first started offering their customers online access to their accounts. But she says the Web-based image-sharing solutions have enough built-in security, with eight-digit passwords and log-ons that make them safe and secure, and it’s largely just a matter of educating users. Early adopters say offering online image sharing gives them a competitive advantage. Randall Stenoien, MD, a radiologist and the CEO of Houston Medical Imaging, has been using Carestream’s MyVue for about one year. Houston Medical Imaging operates three locations and performs 40,000 imaging exams per year. Posters in the waiting room explain how patients can use the portal to access their images and share them with their health care providers. Referring physicians also are told how they can access images with the portal as soon as they are available. Orlando Regional Medical Center, a level 1 trauma center that is part of Orlando Health, has been using Accelarad’s SeeMyRadiology.com since 2009. One big advantage of Internet image sharing is using it to better triage patients, says Carlos Carrasco, the medical center’s chief operating officer. He notes the case of three children who were involved in a terrible car accident in the middle of the night about 90 minutes from the medical center. Bad weather prevented the injured children from being flown to Orlando Regional. Physicians at the local community hospital where the children had been taken could upload their diagnostic images to the Internet. Pediatric traumatologists at Arnold Palmer Hospital for Children, also part of Orlando Health, could access the images on the cloud and triage the children based on what they saw. They determined that one child’s condition was serious, and he needed to be driven to Orlando immediately for surgery. The second child was transferred to Orlando Regional the next day, and the third was treated at the local facility. Carrasco says specialists at Arnold Palmer Hospital also could provide input on the care of the child who stayed at the community hospital based on what they saw on the images they viewed on the portal. The emergency physicians at Arnold Palmer Hospital also could view the images of the patient who needed surgery while they were awaiting his arrival. This allowed them to deliver the appropriate treatment the moment he came through the door. Stenoien has found that patients with a complex medical condition receiving treatment from multiple physician specialists are most interested in using the portal to track and view their studies. They like the capability to send e-mails to their physicians, inviting them to view images and reports as soon as they are ready. In most cases, Stenoien says giving patients’ access to the images and reports only after their physicians have seen them solves the problem. Kao says Carestream’s MyVue allows physicians to customize when patients can access their images and related report, typically after four to seven days. Some physicians thought older patients or those lacking computer savvy or access would be at a disadvantage. That hasn’t been the case for David S. Mendelson, MD, a professor of medicine at Mount Sinai Medical Center in New York City, whose facility uses lifeIMAGE. If patients are older and not Internet savvy but have medical issues, their children or friends act as their surrogates and help them store and view their images online or provide their physicians access. Mount Sinai is one of five sites involved in RSNA’s Image Share project, which promotes the use of image-sharing networks on the Internet. The project, begun in 2009, is funded through the National Institute of Biomedical Imaging and Bioengineering. 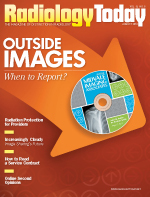 RSNA Image Share is intended to drive all the vendor solutions discussed in this article toward common standards so there is interoperability among all systems, Mendelson notes. Tabatabaie says the images themselves really are just a curiosity for patients. “The reports are so cryptic to most patients, they really don’t know what they mean,” he says. Sharafshahi adds that the reports often are difficult for patients to interpret without a physician’s help. But the vendors agree that’s not the point of the image-sharing portals. “That they have their entire history of imaging studies in a secure place and can share it with anyone, whether another physician or oncologist or hospital, is what’s important, and patients understand that,” Tabatabaie says. He says patients also like that with image sharing on the Internet, they can ask for a second opinion from anyone they want, wherever that physician is located. For example, a physician tells a patient in Los Angeles that she needs a knee replacement. She can go home and call her cousin who had a knee replacement in Cincinnati and have his orthopedist look at it, too. “It gives patients more control over critical health care decisions,” Sharafshahi agrees. Sharing images on the Internet also cuts down on the expense of making multiple CDs for patients and expediting them to physicians in time-sensitive situations, Stenoien says. Tabatabaie says Internet sharing saves the $6 to $8 it can cost to make a CD and deliver it to the patient. Not only is cloud-based sharing less expensive, facilities don’t have to worry about being able to open the CD on their PACS or about patients forgetting to bring them to their appointments. Images are the same quality, no matter how they are shared, Tabatabaie notes. Sharafshahi says online image sharing is free for users. If patients want to copy their images and keep them all in a secure long-term repository on the cloud, they are charged a small monthly fee for the archiving service. Kao adds that fewer than 2% of its users have needed tech support, and most instances involve lost passwords. The platforms are designed so that people can go online, open it up, and use it, she says.